and with manual smoothing of the resulting curves. 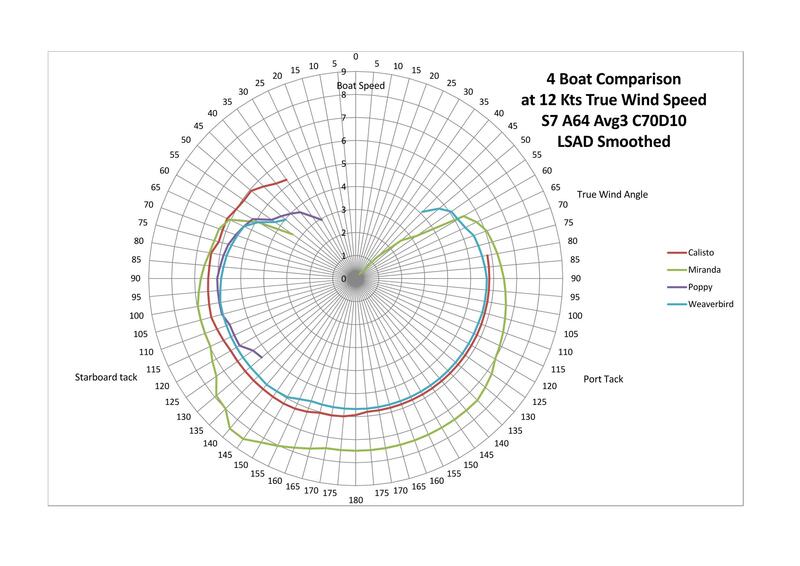 What these show is that the Bermudan rig on the Varne 27 Calisto (red line) is faster upwind than the other rig & boat combinations, especially at the lower wind speeds. Of the junk type boats, the split junk rigged 31ft Poppy (purple line) is slightly better upwind than the others in most conditions. The other two are quite similar with the aerojunk rigged Miranda (green line) being slightly better in lighter winds, and the hinged batten rigged Duette 23 Weaverbird (blue line) slightly better in the stronger winds. Off the wind, the Bermudan rig is better in 6kts of breeze, but at 10kts and stronger the aerojunk is fastest. The split junk and hinged batten sails appear to be very similar off the wind. 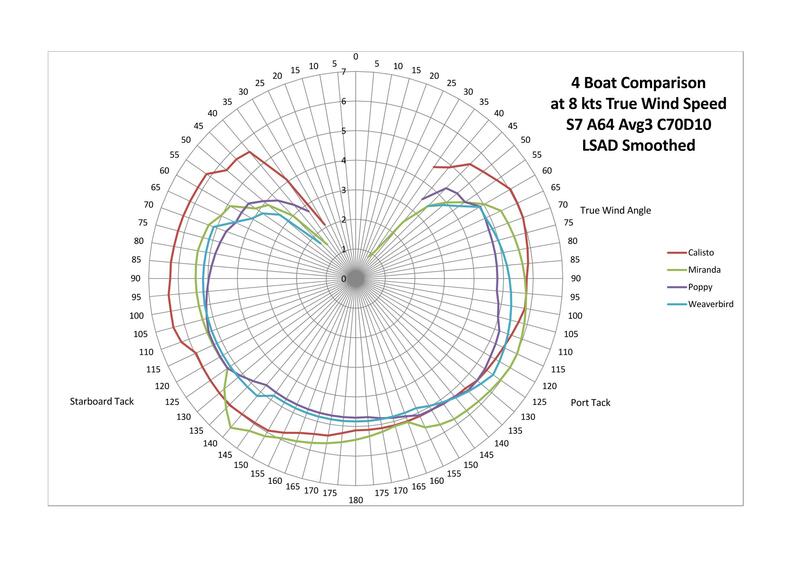 Bear in mind that these results have been corrected for the length, weight, and sail area of the boats, and there is room for debate about the way this is done. The boat speeds have been adjusted to the square root of a sailing length of 25ft, where the sailing length =1/3(2xLWL + LOA). 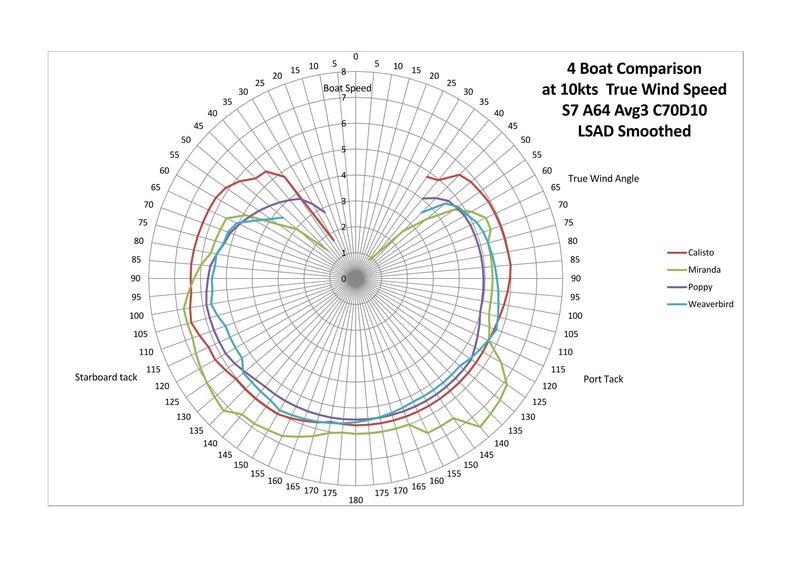 The boat speeds have also been adjusted so to a Sail Area/Displacement Ratio of 18. Thank you to Anthony Cook for doing the processing of the data. 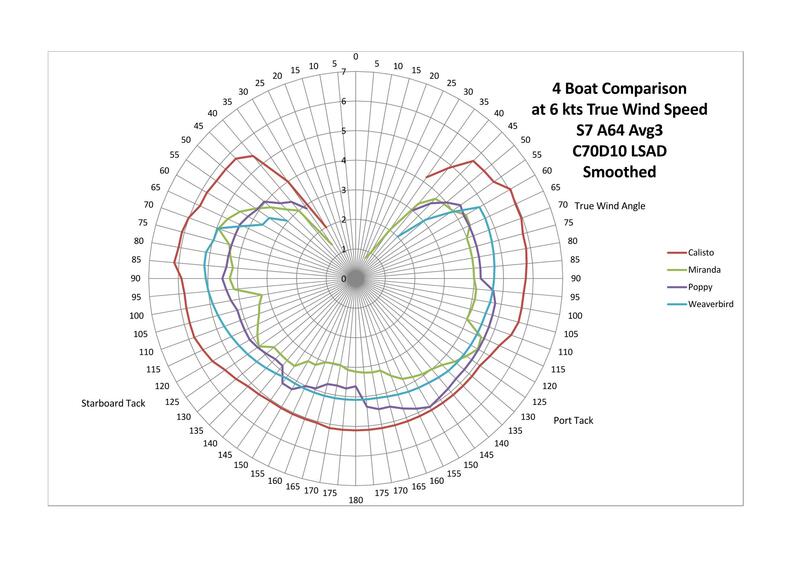 I take responsibility for the choices made about the level of filtering and averaging, downwash correction, and length, weight, and sail area adjustments, and the manual smoothing. Alan Boswell.